So check out this list of 5 great alkaline diet recipes that you can give a try to make dieting a little tastier and a little easier! 1. Mango and Corn Salad with Pomegranate Dressing: There are few options on an alkaline diet menu more colorful than this intricate salad. Start by boiling corn on the cob and chopping up some mangoes and spring onion into spaghetti noodle shaped pieces, or a julienne, and mix the pieces with coriander, deseeded red chillis, and mizuna. In a bowl, combine 2 small cloves of garlic, a top pick amongst alkaline diet foods, grated ginger, lime juice and just a touch of salt. This will serve as your dressing. Make a relish using an ounce of coriander, 1.5 ounces of pomegranate seeds, and half a teaspoon each of pomegranate molasses and lime juice, along with a pinch of salt. Mix the dressing with the salad, top with the pomegranate relish, and the corn cob, which can be sliced and seared before affixing atop your salad. Alkaline diet recipes have never been so tasty! 2. Seed Topped Veggies: Take your pick of olive oil sautéed vegetables from any of your alkaline diet recipes and pile on this tasty and crunchy topper! Dry roast half a cup of pumpkin seeds in a pan until they are golden brown. Toss them with soy sauce. This recipe might seem simple, but it can be a big hit on top of your already delectable whole foods! 3. 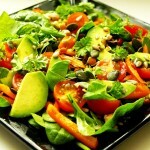 Spinach Salad: Popeye doesn’t have a thing on this top selection amongst alkaline diet recipes. Start by washing and patting dry a pound of spinach. In a bowl, combine 2 tablespoons of lemon juice with a quarter cup of olive oil. Add to the bowl a few drops of stevia and a bit of tamari. Add the cubes of one avocado to the bowl and toss. Add to the bowl your clean and dry spinach and half a cup of roasted walnuts, and toss everything together. Top with sections of mandarin oranges if desired. 4. Millet: You won’t find many alkaline diet recipes incorporating grains; however millet is an anomaly amongst them. To prepare, add a cup of millet to a pot that has a tight and secure lid. Constantly stirring, sauté over medium heat until the color is a nice and golden brown. Add to the pot two and a half cups of water and half a teaspoon of sea salt and boil for 25-35 minutes. At this point, all the water should be absorbed and the millet should be dry and ready to enjoy! 5. Scrambled Tofu: You don’t need to limit yourself to alkaline ionized water on the alkaline diet. Even breakfast meals can be a breeze with a little creativity. Missing the eggs at breakfast time? Well consider a scrambled tofu instead! Crumble tofu into a bowl and mix with fried onions, and diced pepper and tomatoes. Add a pinch of turmeric to the mix and then cook until warm and enjoy! You don’t have to skip on important meals like breakfast on different types of acid alkaline diet plans; you just need a dab of creativity and a little inspiration!